I'm getting a lot of walking in this summer, aren't I? I ventured a bit further out of Edinburgh this week though, to East Lothian, for a coastal walking route. This isn't exactly a hike, since it's level ground the entire way, but it takes 3-4 hours to complete the route, so I think it counts as a good amount of physical activity! It's not much of a path either, as the majority of it follows the beaches around the coast, from North Berwick to Gullane. There are options of paths behind the sand in many areas, but I did most of it on the beaches themselves, only reverting to the path if it got too rocky or awkward. It is recommended to do this one at low tide too, to be able to access the beaches and rock pools, but the paths are there if your timing is off! 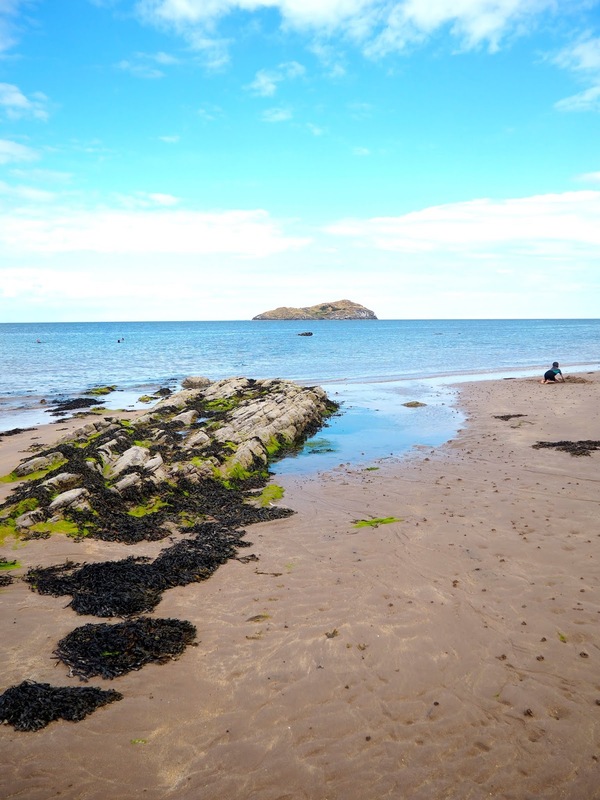 The day started in North Berwick, a quick half hour train ride away from Edinburgh. While I hadn't done this walk or been to Gullane before, I had been to North Berwick a few times, but it's been several years now, and I hadn't been back since returning from Asia last year. So, I spent the first hour or so in the town itself, just wandering the streets a little. It's a small place, but there's plenty nice shops and cafes and such to check out, though I didn't stop in any of them that day. I wandered past the old church remains and the graveyard there, before heading down on to the main beach. From there, you can see the Bass Rock round to the east, and Craigleith island just off the coast. I wandered over the rock pools, since the tide was out, and made my way past the outdoor swimming pool, full of families with children on their summer holidays. The seabird centre is a popular attraction here, but I only went past it, as well as the tiny old church there, to walk around the rocky outcrop there, before continuing on to the west bay. I think it was at this point that I took my shoes off, and did the majority of the walk barefoot, on the sand and occasionally wading in the water. I even climbed rocks and did sections of sandy path barefoot, only putting my shoes back on a couple of times when it just got too stony or rough underfoot, and then obviously at the end again too. It's a seven mile route in total, so it does take several hours, and there's only a couple of places to drop out early, and head inland to nearby villages to seek transport. I stuck out the whole thing, but was a bit relieved when I reached the end, as I was pretty tired during the last 45 minutes or so. It was still worth it though, as this is a very peaceful walk. There were a few people around at the beginning, and on Gullane Beach at the end, but there were huge sections where I was entirely alone. The walk is mainly long stretches of sandy beach, broken up by rocky outcrops, and further on, the beaches do get a bit rockier as well, with some stretches being more stones than sand. 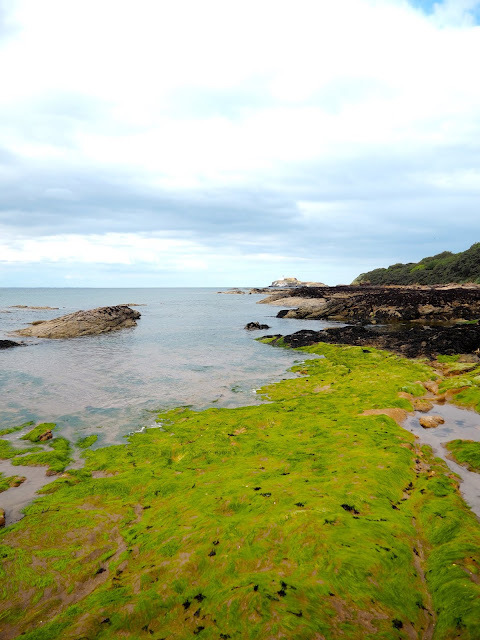 There were lots of rock pools along the way, since it was low tide, though I didn't find much wildlife in them. Plenty of seabirds around though! Behind the beach, it was mostly grassy areas, including golf courses at the beginning, and empty fields later on. To the other side, I had views out to the North Sea and round to the Firth of Forth. After the Bass Rock and Craigleith disappeared from sight, there were also excellent views of Fidra island, with its little lighthouse and huge flocks of birds circulating it, as well as other smaller islands and rocks throughout the Firth, and the Kingdom of Fife over on the other side. I was fairly lucky with the weather, although the forecast wasn't entirely accurate. It was supposed to be partly cloudy, and was actually very sunny while I was in North Berwick, and again once I reached Gullane. However, in the middle of the walk, the grey clouds inland that I'd been keeping an eye, started to creep over and cover up the blue skies that I'd been enjoying on my right, over the sea. It did get very grey for a while, and there was a slight drizzle when I was on Yellowcraig beach, but fortunately, it cleared up again quite quickly. It was still a warm day though, and not as unpredictable as Scottish summer days can sometimes be! Gullane was a nice place to visit, and it's not too far from Edinburgh, about halfway between the city and North Berwick, so even if you don't fancy the seven mile trek, you can visit it on a day out, along with North Berwick. It's a sheltered, sandy beach, less rocky than many of the others I passed, and it was fairly quiet while I was there, since it's not so well-known - certainly less busy than Portobello beach, where half the city (including me) often flocks on sunny summer days. I lingered a little bit as I wandered along it, but not for as long as I perhaps would have had my timings been different, but the buses back to Edinburgh are only every hour or so, meaning I had to head off quite quickly if I wanted to catch the next one. It's a short walk into the centre of Gullane, where there is 124 Lothian bus passing down the main street, which took me back to the city in under an hour. All in all, a day well spent, leaving me tired, but very much content!